This post originally appeared on the IBM IT Infrastructure Blog and was written by Steve Sibley (Vice President, Power Systems Offering Management). Published on August 7, 2018 | Today is a big day for IBM Power Systems. Our initial rollout of POWER9 servers is now complete with our latest offerings. These enterprise-class scale-up servers combine simplified cloud management with leadership performance, scale, availability and security. Did you know that 80 percent of the Fortune 100 have IBM Power Systems? Across the globe, top banks, retailers, insurance and healthcare companies rely on IBM Power Systems every day to help meet their customers’ needs. The IBM Power Systems product team continues to fuel innovation and deliver enterprise servers with high performance, scale and security, while maintaining our longstanding position as the most reliable server in the industry and safe-guarding your investments as you evolve your infrastructure. These are just a few of the reasons customers continue to support their mission-critical workloads with IBM Power Systems. Today we are announcing two new enterprise-class, scale-up servers. 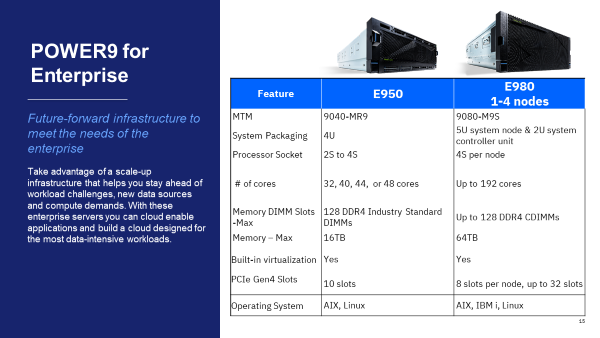 The Power E980, our most powerful, reliable, and scalable POWER9 server, is designed to support the industry’s most data-intensive applications while providing economic flexibility with Power Enterprise Pools and Capacity on Demand. The Power E950 brings unprecedented performance and scale to our 4-socket server with up to 48 POWER9 cores and up to 16 TB of memory. When you combine IBM Power Systems leadership cloud technology, security designed from the ground up, and system innovation to run large-scale, mission-critical applications, these systems are an ideal foundation for you to transform your IT infrastructure into a private or hybrid cloud. These systems are designed to cloud enable even the most data-intensive, mission-critical workloads. PowerVM, the IBM Power Systems hypervisor for data and mission-critical applications, is built in to allow you to dynamically scale compute and memory on demand. This can be based on business needs, and with POWER9 providing accelerated and encrypted live VM mobility. PowerVC, IBM’s OpenStack-based cloud manager, simplifies cloud management and upwardly integrates into most heterogeneous cloud managers like VMware and IBM Cloud Private. IBM’s Capacity on Demand capabilities simplifies your consumption-based infrastructures, only paying for what you use with almost instant response to new workload demands. Whatever your cloud strategy looks like, IBM Power Systems are designed to support your organization to deploy cloud your way without compromising on system performance and flexibility. IBM Power Systems has security built in at the chip level and spanning the entire stack. From the processor to the OS and everything between, our systems are designed to deliver end-to-end security from the time the processor boots. IBM POWER9 servers provide a performance advantage with two times more threads in POWER9 cores than compared x86 cores. Slash time-to-insight with up to 16TB (E950) or up to 64TB (E980) of buffered DDR4 memory for in-memory databases. Speed applications with 1.8 times the memory bandwidth compared to x86 servers. Respond more rapidly and seamlessly to changing business requirements and growth with Capacity on Demand for processors and memory. IBM servers ranked most reliable for the 10th straight year by ITIC with better than five nines uptime1. We are an industry leader for enterprise servers. IBM has committed to a 10+ year roadmap for both IBM i & AIX and provides binary compatibility from release to release to simplify transitions. We remain committed to pushing the boundaries of innovation to deliver the best enterprise solutions that enable you to manage and grow your businesses. IBM Power Systems provides a great foundation for transforming your IT infrastructure as you move mission-critical and data intensive workloads into the cloud. If you have not done so already, I encourage you to watch our SVP for Cognitive Systems, Bob Picciano’s launch video. Visit https://www.ibm.com/it-infrastructure/power/enterprise to learn more or call us at 1-866-872-3902.